Sauté the shallots and garlic in the oil until soft, add the meat stock and the whiskey and bring to the boil. Add the tinned tomatoes and sugar and simmer for 15-20 minutes. Meanwhile, mix the chilli rub and coat each steak with it. When the sauce has your chosen consistency, season it with salt and pepper, cumin and coriander – and add the worcester sauce and tabasco sauce to taste. Shortly before serving, add the tomato puree. Fry the venison steaks in hot oil, about 2 minutes either side. 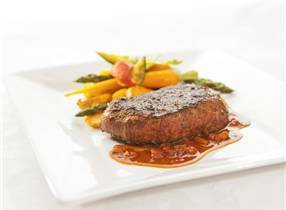 When the venison is medium rare, being soft and pink on the inside, let it rest for a few minutes and then serve with grilled summer vegetables and fried yams, or sweet potatoes.